Over the last two months I have been evaluating the Open Learning Design Studio MOOC (OLDS MOOC). This was written by contributors from several UK universities and funded by JISC. The evaluation has analysed quantitative data captured before, during and after the courseand richer qualitative data provided by participants in pre- and post-course questionnaires and in blogs, posts and comments contributed to the public course space. One challenge has been how to represent and balance the often hugely contrasting perspectives and experiences of the MOOC: how much weight do you give to the views of those who remained for the duration and followed the course instructions, those who started but undertook only part of the course, and those who watched but did not contribute? Another challenge was to determine on whose terms the MOOC should be evaluated. For example: participant compliance with design; participant deviation from design; meeting design goals; meeting participant goals; performance against established measures; and performance against participant defined evaluation criteria – the latter yielded particularly interesting responses in our pre-course survey. To coincide with the announcement of a new Learning Design MOOC (now confirmed as starting in January 2013) some of those registering have been invited to tell us about their previous experiences of participating, or helping organise, open online courses. Information about MOOCs can be difficult to come by, so the thirty-five responses we have received so far (which cover 50 separate experiences of 25 different MOOCs) represents a really interesting dataset. In the survey we asked people about what they had liked and disliked about the MOOCs they had been involved with, what the MOOC did well and not so well, how the issues they had encountered could be resolved and what advice they would give to others planning a MOOC. I’ve taken these responses and attempted to express these as a series of tips – each tip based directly on one or more pieces of advice, suggestions or experiences reported by the survey respondents. If you would like to add your experiences to those already contributed, please visit the survey. Also, as this survey represents the first stage in a broader schedule of monitoring and evaluation for the MOOC, watch out for further reporting over the next six months. 1. Be clear about what type of MOOC you are planning – there is no one way of doing a MOOC for, just like any course, it may draw on constructivism, instructivism, connectivism etc. (or any combination). Be clear about the pedagogy even if just within your design team. 3. Ensure the course rewards participation – some will be motivated by the promise of awards such as badges or certificates however for others the benefit of an enriching experience, helping others, social interaction over a share interest, or better understanding themselves may be as, if not more, important. 5. Consider the expectations and skills of those who will be involved – what are the prerequisite skills required? At what point might the degree of difference between participants become an issue? 7. Consider future participants as well as current participants – will the post, tweets, links etc make sense to someone new visiting the site in 6 months time? Will the course really be ‘open’ across time as well as open geographically at the time it takes place? 8. Expect a high-drop out rate – low barriers to entry may also mean low barriers to withdrawal or lower tolerance thresholds). Take the opportunity to reflect on what a drop-out rate of 50% or 90% of registrations would mean for your course, for the participants registering on the course and your own educational mission/purpose in organising it. 9. Create a sense of closure at the end of the course – for example, as one respondent suggests ‘an assessment, a designed activity or summary podcast’. 12. Determine and communicate a vision for how different forms of knowledge will be handled and privileged within the course – are some forms of knowledge more authoritative? Do anecdotal opinions carry equal weight to empirical published research? Over the last month I’ve been working with the rest of the OULDI team on finishing our final Evaluation and Project reports. 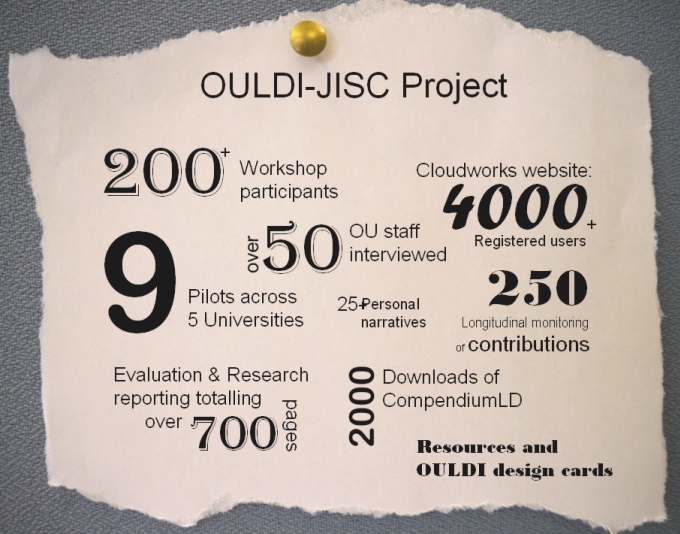 The focus of the OULDI project has been on developing and piloting tools, resources and approaches that support institutional curriculum design processes and design practice/cultures. The Evaluation Report (91pp) pulls together research and experience from all five project strands and nine pilots. First the report reviews the tools we developed and trialled for sharing learning design expertise (Cloudworks), for visualising designs (CompendiumLD, Module Map, Activity Profile) and for supporting design and reflection in workshops (Facilitation Cards, workshop activities, etc.). The Report then presents evidence for how effective these have been and what this tells us. For example: how do communities of practice use a shared design space? How well do university processes map actual practice? What benefits and barriers can we discern? What discourses of resistance and case studies of personal success have we recorded? 1. There is often a great difference between the idealised process (that codified in guidance and formal organisation of staff) and the real process interactions that take place. It is in the practices and culture of the latter – the lived enacted process –that this project has particularly sought change. 2 The challenge of convincing staff that a design approach would be helpful can be hindered by the difficulty in demonstrating or ‘proving’ there is a need to change. 3. The project has provided insight into how interconnected the stages are in the design process. It has noted the problem of course teams moving too readily past the design in to the ‘embodiment’ phase of course creation and of designers evaluating tools in respect to how much the tool saves them time or effort rather than on the benefits to others in the process, most notably students. 4. Stakeholders differ in their understandings of the purpose and potential of curriculum design. 5. Tools or design activities that represent a minor step for staff are more likely to be accepted and used. This may be because they require little change of design practice/approach or the learning of new pedagogic knowledge. 6. There is a complex and nuanced relationship between course quality and the time expended in design. Providing even modest additional opportunities to reflect on or to discuss designs with others can lead to improvements in the design quality. 7. The open exchange of teaching and learning design experience remains limited to a small minority (between 5 and 10%) of staff although there is clear evidence of users being interested in reading others posts and observing the sharing of knowledge. 8. Communicating the breath of the project ambition – of working concurrently with and the overlap between multiple strands of work has as times proved a challenge. 9. The project has derived great benefit from being part of a twelve project national JISC programme and from gaining insight and experience of other institutional practice. 10. Project tools and resources use a variety of representational forms; from concept mapping to structured tables. 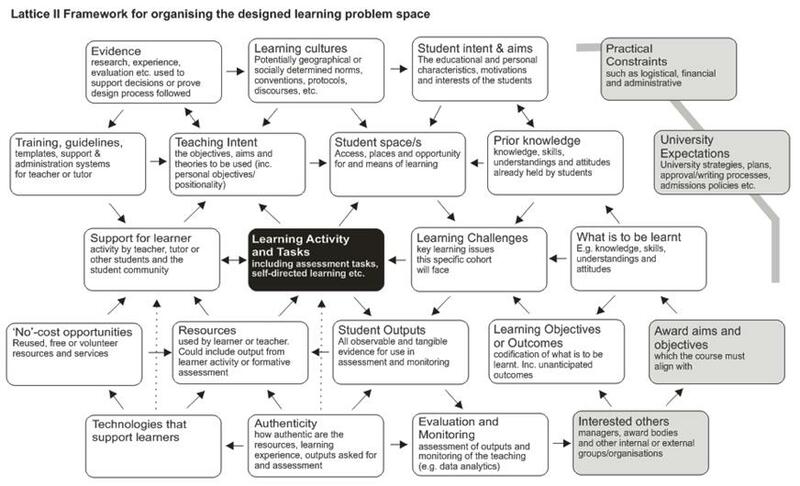 Many of these are different to current methods of representing learning and curriculum designs. As such, in disrupting practice and accepted process, they have the capacity to offer new perspectives, to challenge, and to promote reflection. Whilst not necessarily conducive to making a process shorter, such disruption may help make it more efficient, effective and capable of delivering greater quality outcomes. There is a separate report for each of the project’s nine pilots and over twenty personal narratives/case studies. For example see: Galley, R. (2012a) The impact of early learning design on the efficiency and effectiveness of curriculum design processes and practices: Faculty of Education and Languages Studies Case Study Final Report. Earlier this afternoon I presented a paper at the Blended Learning Conference 2012 titled ‘Defining the Learning Design Problem Space:Creating a Better Learning Solution. The slides will be posted shortly, but in the meantime, here is the revised Lattice Learning Design Problem Framework which was used during the session. In this post I want to propose three ‘lenses’ that may be useful for describing and understanding the nature of a teaching and/or learning innovation. Innovation is certainly a prized commodity; deemed important enough to use to structure formal university module development and delivery processes, and to trade across and between practitioners and instititions. We also know that the question of innovation is likely to be an important consideration early on in the process of creating, designing and teaching a module or learning activities (and hopefully later on in the process also!). So how do teachers talk about and represent their innovation? I have been involved in a couple of projects that sought to to capture innovation and, like similar attempts elsewhere, found it difficult to define what innovation was. The conclusion is, of course, that innovation is a nebulus term embracing everything from a paradigm shifting idea to borrowing one from a colleague and using in a class. Broadly speaking, one could suggest that innovation is anything that creates new possiblities by combining different knowledge sets that should result in positive change or added value. This expectation for there to be a positive result I think distinguishes innovation from other terms such ‘something different’ or ‘ something new’ and prevents it being abused to the extent that ‘being innovative’ becomes an aim in itself. So if innovation can be many things, do we need to be more precise in how we talk about it? Perhaps, like for other aspects of learning design, it could be helpful to have some lenses with which to view, describe and define it. Fair enough, each lens will present only a partial representation, but together such views may help better understand the character of the innovation and to use and evaluate it effectively. LENS 1: For who is the innovation innovative? Each individual, group or community who experiences the innovation will likely experience it differently: what is innovative for one module author may not be for their students who did it last year on a previous course; what is innovative for the general way a subject is taught may actually be ‘common practice’ for a ‘leading-edge’ faculty or university; what is innovative in one faculty may not be so across the univeristy. So this first view represents seven key stakeholders in the educational innovation. When selecting these seven, I looked at the ways practitioners (in interviews or in written documents) spoke about who their innovation was innovative for. I also thought it important that the diagram be organised in terms of the scale/size of the group effected (note the progression from the individual (on the far left) to the entire sector (on the far right)). Arranging the representation in this way should make it is easier to see how extensive or local the innovation may be.